Museums at Night is Culture24's UK-wide festival of inspiring after hours cultural events in Museums and Galleries. It runs from Thursday 16th May until Saturday 18th May 2013. On Friday 17th May from 7 � 8.30pm as part of the Museums at Night celebrations Caithness Horizons is hosting the Inaugural Meeting of the Caithness Horizons Great Guild of Museologists. Museology is the study of Museums. Professor Katness H. O�Rizons and a panel of equally world renowned experts will be debating some of the Museum�s more weird and wonderful artefacts. Come along and listen to the evidence, examine the artefacts yourselves and vote for which expert is right. Suitable for children aged 7 � 12 years and families. This very special production is being performed by the Youth Section of the Thurso Players. It is being directed by Audrey O�Brien and has been written by Philip Arthur. Scotland welcomes the world for the Year of Homecoming 2014. Homecoming Scotland 2014 offers a year-long programme of events celebrating the very best of Scotland�s food and drink, our fantastic active and natural resources as well as our creativity, culture and ancestral heritage. Cafe Exhibitions Meg Telfer & Rhona Graham November Until the end of November these two local artists will be exhibiting their work in the Gallery Cafe. Christmas Exhibition December Throughout the whole of December an exhibition of small works by local artists will be on show. Petr's Pals Curators Club for youngsters is getting popular and priority is given to them for events. Book early for your children if you want them to attend. Exhibitions Sue Jane Taylor �Beatrice Works� Exhibition Temporary Exhibition Gallery Until 22nd August The �Beatrice Works� exhibition is open until 22nd August so if you haven�t already been to see it make sure you don�t miss your chance! Thurso Gala: Children�s Art Competition Exhibition Cafe Throughout August Throughout August the Thurso Gala children�s art competition entries will be brightening up our Cafe walls. Do come and have a look at the fantastic work that is on display. MUSEUM PROJECTS TO RECEIVE �300K INVESTMENT ANNOUNCED. A new roof, Homecoming 2014 events, collection redisplays, enhanced security and marketing training and support are some of the benefits to come from Museums Galleries Scotland�s new Strategic Investment Fund. We�re planning an ambitious programme of events to complement this Summer�s major exhibition in our Gallery. During May and June, Sutherland based artist Sue Jane Taylor will be joined by Caithness STEM Ambassadors to work with young people from Caithness and North Sutherland schools, exploring how current developments in renewable technology are making an impact locally as well as nationally and internationally. Stroma Visit - Saturday 10th August 2013 Last year we organised a visit to Stroma, prompted by interest from the Islands Book Trust, and readers of their book Stroma, published in 2010. Taking the abandoned island as its subject, the book features photos by Roddie Ritchie, with poetry by Caithness writer George Gunn. April Exhibition of paintings inspired by the Caithness landscape by local artist Tom Newton. 21st April�Peter�s Pals session on Museum Pests with fibre artist Joanne B Kaar. 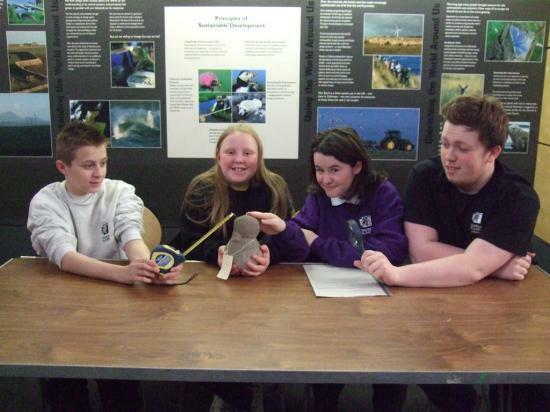 On 19th and 20th January Caithness Horizons will be launching a new initiative called "Peter's Pals" a Young Curators Club for children aged between 8 and 12 years old. Led by �Peter� the Museum�s mascot who is a Little Penguin (scientific name: Eudyptula minor) and the Museum Curator �Peter�s Pal�s� will meet regularly (once a month apart from at Christmas and during the summer holidays) to investigate the Museum Collection; participate in workshops to learn new skills relating to the Museum�s Collection.